Version 2 of the Peregrine now features an even more minimal upper of the shoe than the previous version, but still uses the same platform making it low profile like version 1 and also with excellent traction on uneven surfaces. A minimalist, lightweight, trail shoe from Saucony. 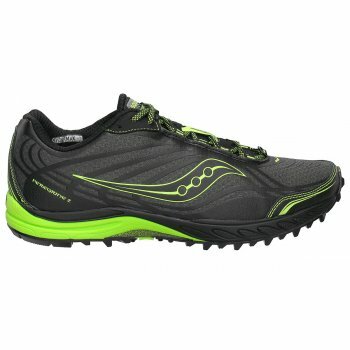 Similar in design to Saucony's popular Kinvara road shoe, but with an outer sole with XT-900 grip and EBO rock protector. It weighs in at only 258 grams. For those looking for a trail shoe that offers a bit of cushion, good grip and has a low heel that allows for a more efficient midfoot style of running. The Saucony Peregrine is it. The outsole is grippy and durable so ideal for those training runs that take in a mixture of tarmac and muddy tracks. The Saucony Peregrine is also light enough to be used as a trail race shoe.